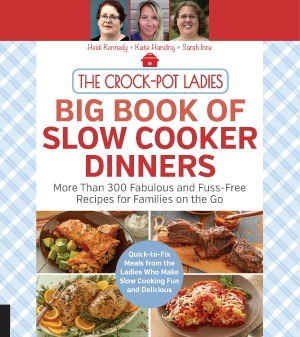 I am always looking for a new side dish recipe to serve my family on our weekly Sunday dinners. Sunday is the day when all my children and grandchildren come for dinner. 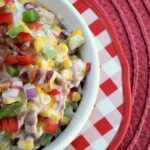 During the summer months we usually throw something yummy on the grill and I come up with a couple of delicious side dishes. For this side dish I wanted to come up with something to use up a big bag of frozen corn I had in the freezer. It seems that every time I go grocery shopping I grab a family size bag of corn. Then, I realize I have SEVERAL bags of corn stashed away in the freezer. Corn is after all one of my kids favorite vegetables! 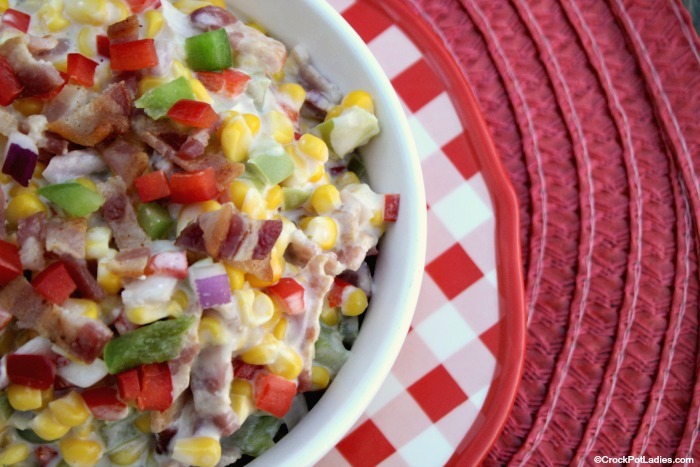 I decided to go for a creamy corn with some bright pops of color and flavor using red and green bell peppers. And to send this over the top…bacon. Because everything is better with bacon right? My family loved this corn dish. The flavor is spot on. There is just a little bit of spice to it from the pepper jack cheese. But it is not spicy at all. Even my 8 year old grandson loved it. If you want to kick up the heat a notch you can throw in a finely diced jalapeno pepper or two. I tried to make this a little bit healthier by using center cut bacon and fat free half and half. But if you are not worried about it feel free to use regular bacon and full fat half and half (or heck…go wild and use some cream!). 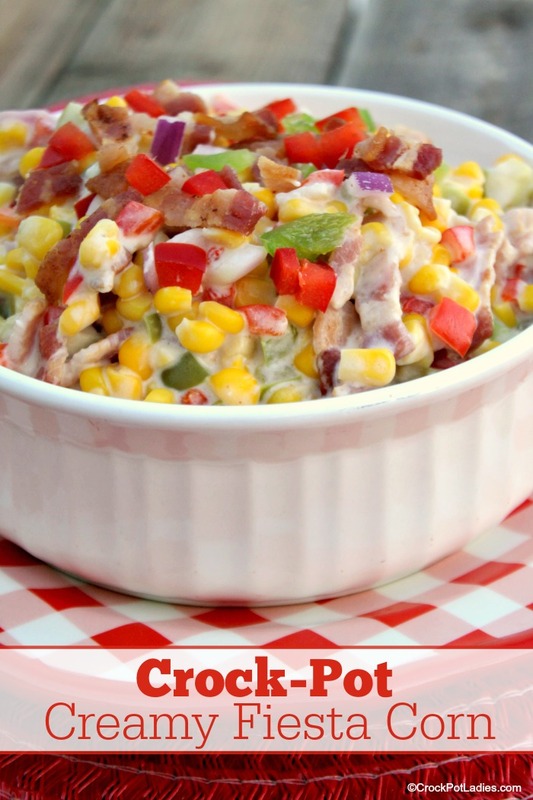 The flavors in this corn side dish recipe are out of this world! A great side dish to go with any entree or to bring to a potluck! The green and red bell peppers add a bright pop of color! Heat a medium sized skillet on the stove-top over medium heat until hot. Add the diced bacon and cook until crispy. Remove cooked bacon from the pan with a slotted spoon and allow to drain on a plate lined with paper towels. Drain off excess bacon grease from pan. Add the diced green and red bell peppers and onion to the same pan and briefly saute until they are slightly softened. About 3 to 5 minutes. Add the cooked bacon, peppers and onions, frozen corn, cream cheese, pepper jack cheese, and half and half to a 5 or 6 quart slow cooker. Cover and cook on HIGH for 3 hours or on LOW for 6 hours, stirring the corn mixture halfway through the cooking time. Once done cooking, stir everything well once more to make sure the cream cheese and pepper jack cheese is evenly melted and distributed. I am not sure I follow kay-m on your comment on the serving size. Do you mean it is too big or too small? I found that this recipe made a LOT of corn. Filling my slow cooker 3/4 of the way full because it uses 20 ounces of corn. It served our family of 7 each a nice sized side dish serving size plus we had some leftover. I forgot the pepper jack cheese so I used a Mexican blend shredded and added hidden valley ranch salad dressing just a few good squirts to add the flavor . That actually sounds pretty tasty Kerry! How did it turn out for you with your recipe modifications?